Previously sold in our London Rooms, 6 June 2000, lot 335. 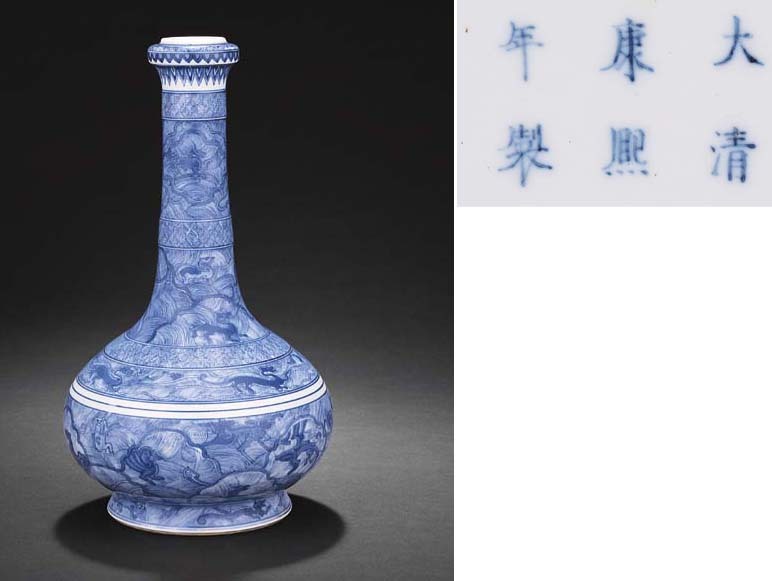 Only one other vase of this design appears to be published, from the Qing court collection, illustrated in Blue and White Porcelain with Underglazed Red (III), The Complete Collection of Treasures of the Palace Museum, Hong Kong, 2000, pl. 19. It has been mentioned that the form of the vessel is derived from Han dynasty hu-shaped bronzes, ibid. The design of mythical beasts flying over turbulent waves found its revival in the early Ming period, gracing the porcelains of the Chenghua period and the parcel-gilt metalwares of the same period and later. This design of the Hai shou or 'sea creatures' first appeared in the Shan hai jing, the Classic of the Mountains and Seas, which was written in the late Zhou to early Han periods. The Classic contains over 200 mythical figures and is the source for many ancient Chinese myths. The Shan hai jing was rediscovered in the Chenghua period and illustrated copies were published and possibly used as templates for ceramic designs. See, for example, the blue and white bowl with this design, included in the National Palace Museum, Taiwan, Special Exhibition of Ch'eng-hua Porcelain Ware, 2003, Catalogue no. 17; and the doucai jars, nos. 114 and 115. On the present vase, the creatures are rendered in a more stylised manner against a dense wave ground. The shape of the vase is also very unusual, and appears to be based on the garlic-head vases of the late Ming period.